Dedicated to the pursuit of Rosicrucian knowledge, this handsome building of Egyptian design contains a remarkable collection of books and other research materials on most esoteric subjects, as well as cultural, scientific, and other fascinating material. 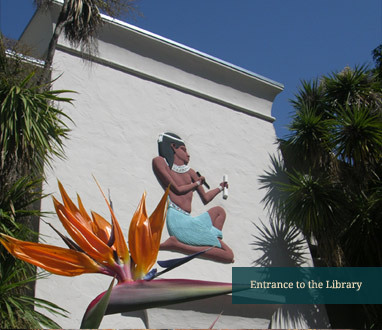 Rosicrucians living in or visiting the San Jose area are encouraged to make full use of the library. Scholars, researchers, students, and the interested public are also welcome to study here as well, as a service to the community, another manifestation of H. Spencer Lewis’s dream for Rosicrucian Park. Over the library entrance, illuminated at night by the light of two torches, the bas-relief of a kneeling scribe suggests this building’s dedication to the pursuit of knowledge. Wherever AMORC made its headquarters, H. Spencer Lewis set up a library for use of the staff and members. In 1916, when the headquarters of the Order was in New York City, a library was located on the second floor, directly above the executive offices. Later, when the Order’s headquarters moved to San Francisco, there was a “fine reading room, and a very large library of the best occult, mystical and metaphysical books obtainable.” When AMORC moved to Tampa, Florida, in 1925, the Order maintained a metaphysical library that also operated as a public reading room. Shortly after the move to San José in late 1927, a library was formed once more. When the Rosicrucian Planetarium was built in 1936, these books were placed in the private wing of the new building. When AMORC moved to Tampa, Florida, in 1925, the Order maintained a metaphysical library that also operated as a public reading room. Shortly after the move to San José in late 1927, a library was formed once more. When the Rosicrucian Planetarium was built in 1936, these books were placed in the private wing of the new building. Realizing the need for a larger facility, Ralph M. Lewis, then Supreme Secretary of AMORC, drew up a proposal for a new Library building, and the work began! Members generously donated money, time and books to this initiative. Since June 19, 1939, the collection’s core has grown in its present home, from the personal libraries of Rosicrucian Park founder H. Spencer Lewis and that of his son, Ralph M. Lewis, who established the Library, through the generosity of members and friends of the Order. Today the Library, having celebrated its 75th anniversary, remains dynamic, digitalizing its catalog, planning for a state-of-the-art Library facility, and continuing to be a treasured resource for scholars, mystics, and seekers. "One's aim should be to concentrate and simplify, and so to expand one's being ... and so to float upwards towards the divine fountain of being whose stream flows within us."